Minimalist design, clean, simple and easy to use but powerful template for your Joomla Ecommerce websites based on HikaShop Extension. 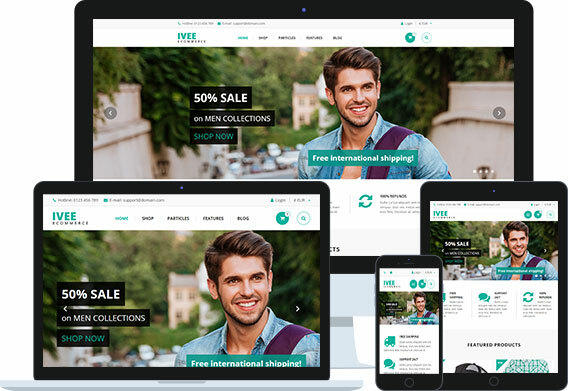 Ivee Ecommerce is a perfect Joomla template for selling your products online whether it’s Physical or Digital (downloadable) products. Powerful drag & drop layout builder with unlimited module positions, Easy styles configuration with unlimited colors and huge in-built particles for created pages without coding. User friendly ajax product search, filters and List-Grid view switcher. 4 customizable Countdown/timer with custom product listing. 4 customizable Counters to show any types of counter. 5 styles to list images with title, description and link. Customizable OnPage Menu to browse id attributes on same page. 2 opening hour styles, support time zone, status and working days. Portfolio listing with 8 styles, Ajax search and filter button. 9 customizable progress bar with animated progress. Easy to create small to large tables with Table particle. Customizable player support Mp4, YouTube and Vimeo videos. * Fixed Login/Register Accordion on checkout page.